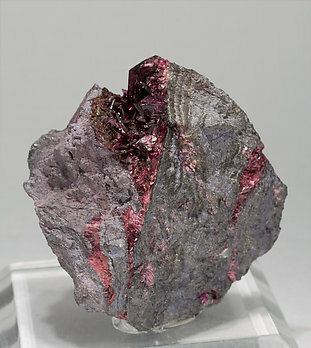 Divergent groups, on matrix, of very sharp Erythrite crystals with very well defined faces and edges, a good length, bright and with a very intense color. 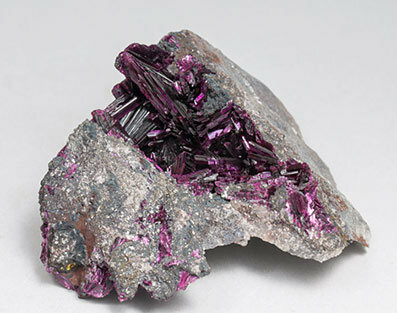 Group of sharp crystals of Erythrite with very well defined faces and edges. They are very bright and have an excellent, very deep, color. They are on a metallic matrix, probably Safflorite, and have, in some areas, scarce coatings of Limonite that we have analyzed. 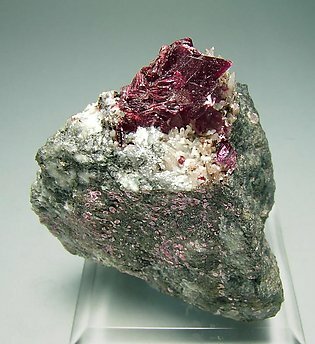 Centered growth, very aerial and on matrix, of very well defined elongated crystals with uncommon terminations that are more rounded than usual. Translucent, very bright and with an excellent deep color. 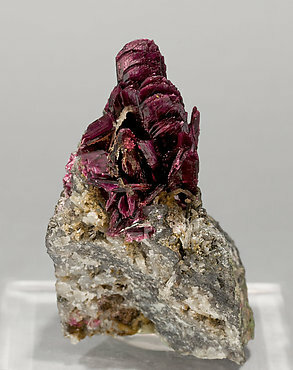 Fanlike aggregates, on matrix, of sharp flattened prismatic crystals with a very deep color and intense luster. 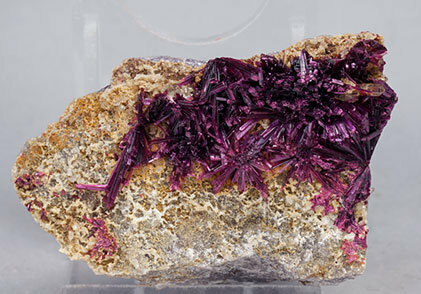 Group of very sharp translucent crystals that are very bright with a really deep color and fill a vug on a matrix of metallic sulfides. 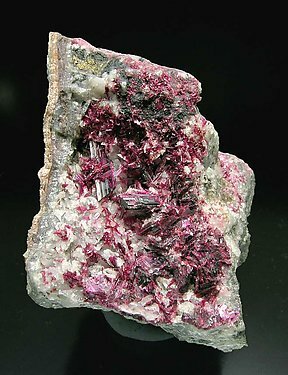 Fanlike aggregates of sharp Erythrite crystals. 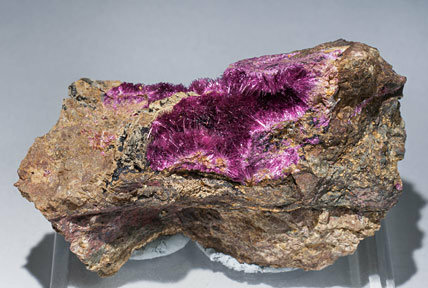 They are bright, have an excellent very vivid color, and are on matrix, with small Quartz crystals. Small but great. Really good color and presentation of a group of crystals that have no damage to their tips. So almost a miracle! 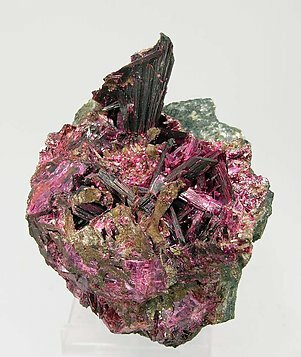 The small pink rosettes associated with the main crystals are a second generation of Erythrite. 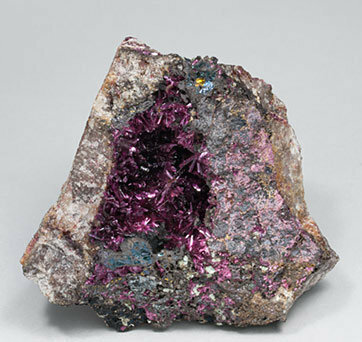 A vug, on a rock matrix, upholstered by very bright and fine fibrous crystals with a very vivid hot-pink color. This habit is well known at Bou Azzer but is not too frequent. 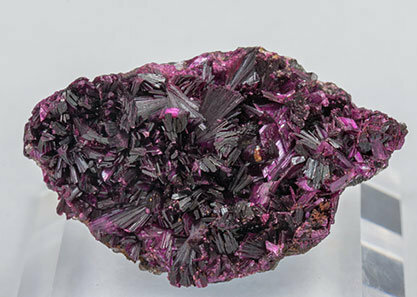 Druse of very Sharp Erythrite crystals on matrix. 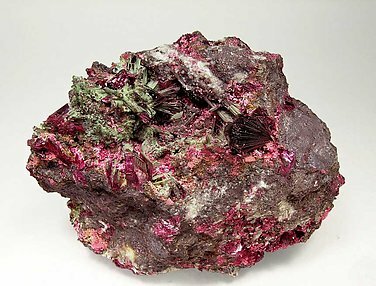 They have a very vivid color and some of them are coated by greenish white Bariopharmacosiderite microaggregates. The Bariopharmacosiderite has been analyzed and we’ll send a copy of the analysis to the buyer. A novelty at Ste. Marie 2010. From a small vein in the Agoudal area different from the classic veins of Bou Azzer. 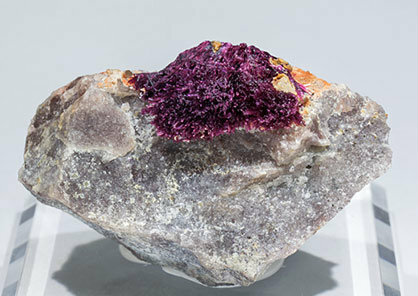 The crystals, on matrix, form parallel groups, large for the species, with an excellent definition of faces and edges and exceptional depth of color and intensity of luster. Some of the smaller groups are partially coated by Bariopharmacosiderite which has been analysed. We’ll send a copy of the analysis to the buyer. A novelty at Sainte-Marie-aux-Mines 2015. 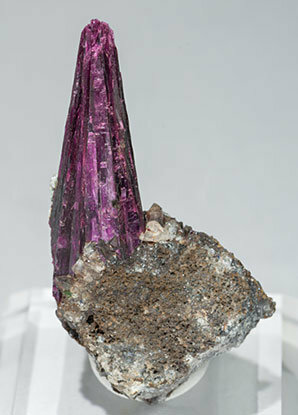 Aggregate of very elongated crystals that have a quite different shape than the better known Erythrite from Bou Azzer. 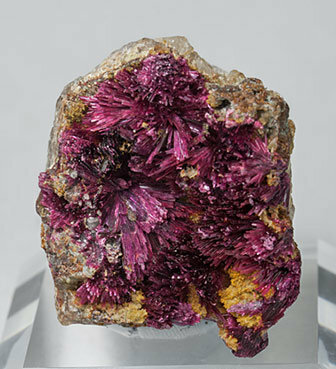 These crystals in a Phlogopite-rich matrix are notable by their luster and color, very intense and uniform. A novelty at Sainte-Marie-aux-Mines 2015. 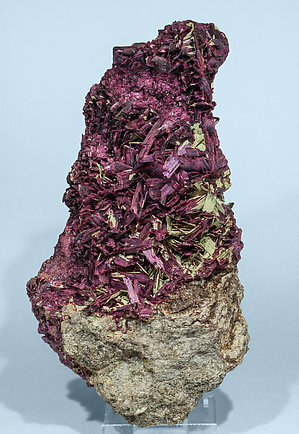 Aggregate of very elongated crystals, of good size, that has a quite different shape than the better known Erythrite from Bou Azzer. 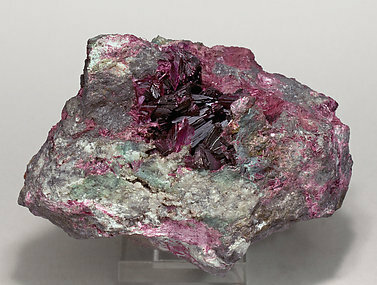 These crystals in a Phlogopite-rich matrix, are notable by their luster and color, very intense and uniform. A novelty at Ste. 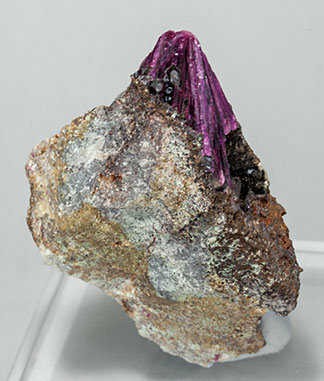 Marie 2015, a new worldwide locality for fine Erythrite! 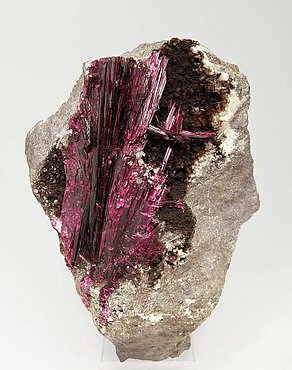 The very thin and elongated Erythrite crystals are in radial aggregates whose shape is quite different from those from the better known Bou Azzer. The crystals, on a matrix partially coated by Phlogopite (analyzed) have very good transparency, luster and color, very intense and uniform. A novelty at Sainte-Marie-aux-Mines 2015. 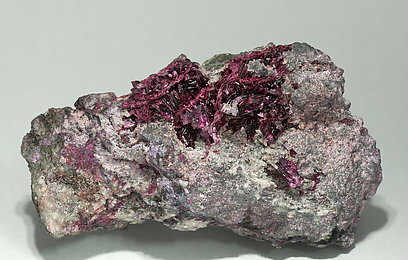 Aggregate of very elongated crystals that have a quite different shape than the better known Erythrite from Bou Azzer. 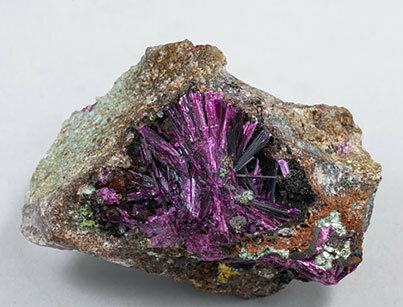 These crystals in a Phlogopite-rich matrix and with iridescent metallic sulphides, are notable by their luster and color, very intense and uniform. A novelty at Ste. 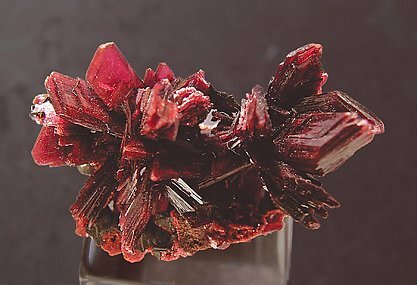 Marie 2015, a new worldwide locality for fine Erythrite! Although it looks very similar to the famous Bou Azzer ones, the deposit of this specimen is located about 500 Km. from the Bou Azzer Mine and in a different geological environment. As far as we know these Erythrites were not known before and they come not from the Tazalarht quarries but in a new shaft/prospect located very close to the Tazalarht quarries. 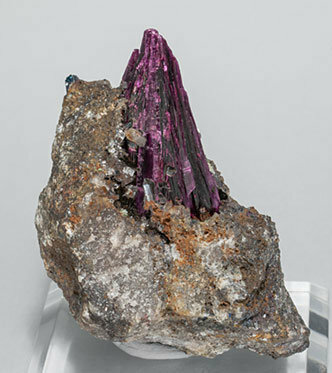 Related species are Quartz, Phlogopite (analyzed) and a mix of Chalcocite-Djurleite-Digenite in the matrix. A novelty at Ste. Marie 2010. From a small vein in the Agoudal area different from the classic veins of Bou Azzer. 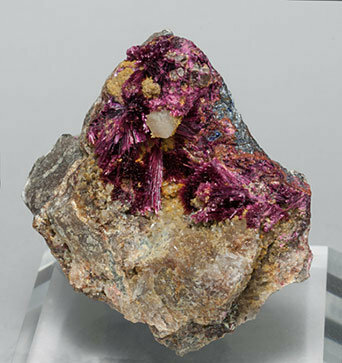 The crystals, on matrix, form parallel groups larger and thicker than usually seen in this species, with an excellent definition of faces and edges and exceptional depth of color and intensity of luster. A novelty at Ste. Marie 2010. From a small vein in the Agoudal area different from the classic veins of Bou Azzer. 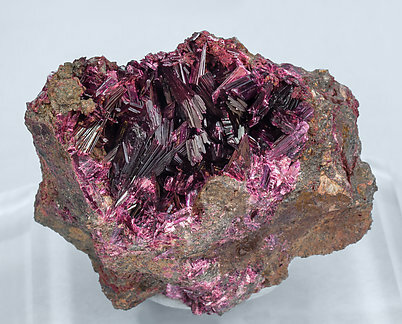 The crystals, on matrix, form parallel groups, much larger than usually seen in this species, with an excellent definition of faces and edges and exceptional depth of color and intensity of luster. On Quartz crystals partially coated by, probably, Heterogenite (not analyzed). 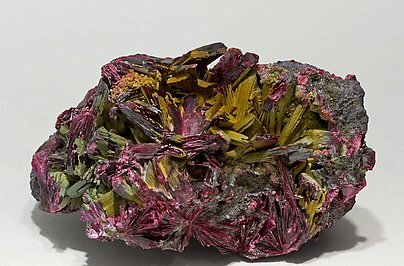 Prismatic crystals with excellent color and luster, on matrix. The specimen is with a label from Juan Montal, Vilafranca del Penedès, with a note with the date May 1, 1967.